It also carries a CCD NTSC video recorder, digitised to provide 209 by 274 km coverage snapshots using a mechanical shutter. A piezoelectric Particle impact detector measures the micrometeorite environment. A light spectrometer employing an NEC linear CCD measures the spectrum of sunlight reflected from the atmosphere. An L-band video uplink receiver allows NTSC video uplink to be digitised. 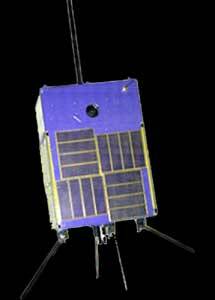 The satellite employs a V40 processor running at 9.83 MHz, with 8MBytes of RAM. The ADCS systems comprises a horizon sensor using two photodiodes with 22° field of view, a fluxgate magnetometer, permanent magnets, hysteresis coils, and black/white painted antennas for spin control similar to a "photometer". The satellite suffered an apparent radiation induced computer failure on the 23. August 1997, which recovered in November 1997. It was officially declared non-operational in 1998 when engineers were unable to resolve a software crash.